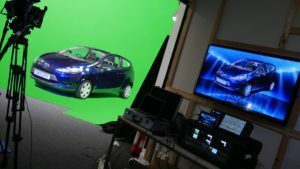 Filming Virtual Reality is fast becoming a specialty at our Manchester green screen hire studio Galleon Studios. As a green screen production company, one of the more recent and interesting developments in video production is the growth of Virtual Reality. Virtual Reality or VR is the immersive experience of entering a completely CGI world that simulates reality. These technologies generally involve wearing a headset or body suit to better integrate into the VR experience. Move your head and your perspective changes, move your feet and hands and they interact with the new world about you. Manchester is home to some of the companies pioneering VR. Some use VR for gaming, some offer it on a corporate level to better explain big data, some Virtual Reality companies use it in sport and rehabilitation, some in engineering and technology. These tech companies increasingly need a way to showcase their products. It’s very difficult to illustrate to a client what VR does unless they can see it and without getting a headset to them this is nearly impossible. Emphasise nearly. Olaf of VRMed used Galleon Studios for his VR project. Without a context potential customers to VR aren’t going to watch someone on a headset. It represents the same interest as watching someone play a computer game, and in this instance, you can’t even see the game they’re playing. This is where Galleon Studios and filming Virtual Reality come in. We have been employed by companies who want to demonstrate their cutting-edge Virtual Reality by using the green screen infinity cove. The green screen is a blank canvas for your product allowing you to comp in the CGI world the headset wearing user is immersed in. This video can then be sent to your potential customers and suddenly your Virtual Reality idea just “clicks”. We benefit from an L shaped cove giving more scope to demonstrate your VR product. What’s more with our live keyer you can preview and even capture your VR world and the player within it. Seeing both together gives substance to the world you’ve created and gives an added immediacy to your video. 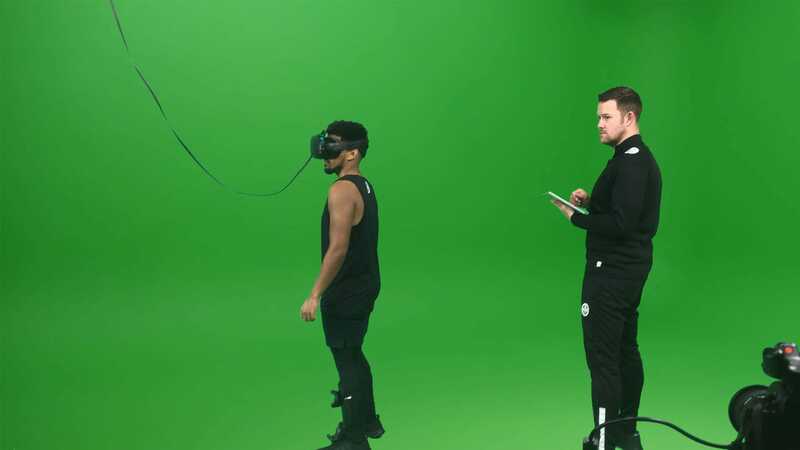 Below is a green screen video produced by MiHiepa in our green screen studio in Manchester spotlighting their amazing work in the VR field regarding Soccer training and rehabilitation. Not only do they aim to allow players to play whatever the weather and whatever the environment but can assist in player recovery in a huge number of ways. The product video succinctly demonstrates the advantages of contextualising your VR product using green screen.